The Joint Admissions and Matriculation Board on Tuesday warned prospective candidates for the 2018 UTME to be wary of fake past questions in compact disks being circulated in the country . The board made the call in a statement signed by its Head of Media , Mr . Fabian Benjamin , and made available to the News Agency of Nigeria in Abuja . 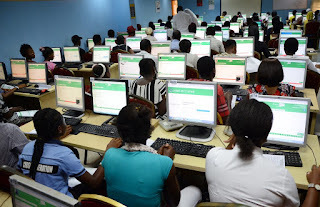 “The fake past questions in CD Rom entitled , “JAMB PRO CBT practice software for UTME ” was purported to have emanated from JAMB in order to give credence to the products . The board said it had not authorised any individual or groups to do so on its behalf . It added that preliminary investigation conducted showed that the past questions were fake and had no semblance whatsoever to the board ’s question papers in context , content or form . “As a responsible and responsive organisation , we will not be part of any ploy to defraud innocent candidates . The board reiterated its commitment to continuously ensure that candidates applying for its examination were not misled , while calling on them to also avoid fake online sites .